Parmigiani Fleurier is enhancing its Tonda Métropolitaine Collection with a spectacular aventurine dial. The golden fragments in this exclusive material shine like stars, which explains why it is called the "Galaxy" model. The Tonda Métropolitaine Galaxy: poetic, majestic, feminine. Small inclusions of metal give aventurine its characteristic textured appearance. 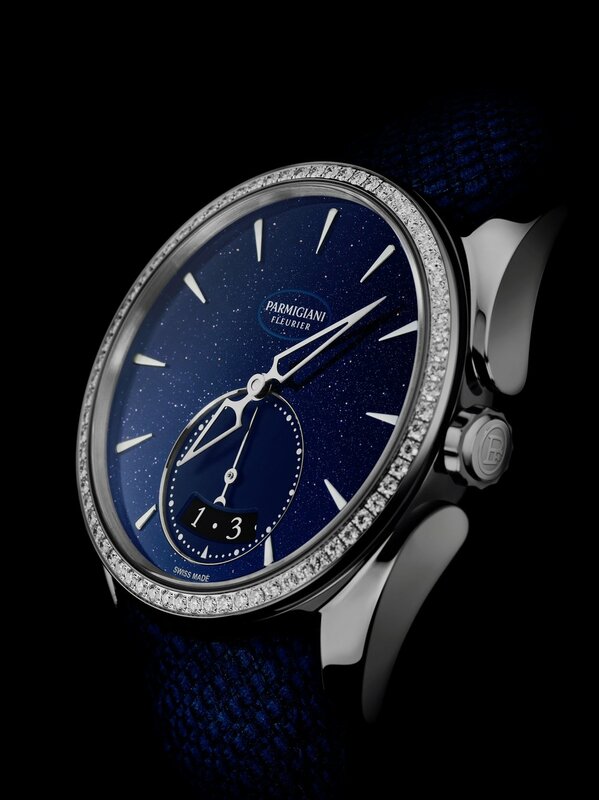 Taking advantage of the natural composition of this material, Parmigiani is presenting a midnight-blue aventurine dial whose surface mottled with fine golden fragments looks astonishingly like stars sparkling in the night sky. The hands are skeletonised so as not to obscure the beauty of the dial and the appliques are made from white gold, gold being the distinctive feature of the indices on aventurine dials. The steel bezel is set with 72 brilliant-cut diamonds, totalling 0.51 carat, which extend the brilliance of the aventurine all the way to the case. At 6 o'clock, the small seconds stands out on a midnight blue background, revealing the date on a matching date disc, which is half a shade darker. The Métro collection of round, steel models features a contemporary, urban design which is more refined than the brand's other classics in the Tonda 1950 line. The subtlety of the design comes from the watch's two asymmetric profiles. Its left-hand profile devoid of the crown is conventional, with its two iconic teardrop-shaped lugs. However, its right-hand profile features elongated lugs that extend to the crown, hugging it tightly. This asymmetry gives the watch its stylish identity and a touch of modernity. In 2014, Parmigiani Fleurier launched the Métro collection and, in particular, the Tonda Métropolitaine's PF310 movement. This new range of movements, entirely manufactured by the Parmigiani Fleurier Watchmaking Centre, represented an industrial feat for the manufacture, which developed optimised production processes specifically to create it. Linear transfer machines, coupled with the use of die stamps, ensure uniformity of production resulting in a calibre which is uncompromisingly reliable. The rationalised manufacturing processes are therefore repeatable in terms of quality and accuracy. Additionally, the manufacturers have created "one-piece" designs to enable multifunction components to be produced, where possible, thereby decreasing the adjustments required. Finally, all the Watchmaking Centre's combined expertise has been focussed on perfecting the precision of the movement. This is the case, for example, for the variable-inertia balance, which now eliminates the need for the standard index-assembly. This innovation makes it possible to adjust the moment of inertia by rotating the inertia blocks rather than adjusting the active length of the balance-spring as required with a standard adjustment. It also functions stably over the long term, makes the watch shock-resistant and, as the counting-point is maintained, guarantees outstanding isochronism. This consistency is reinforced by the double barrel which enables a more stable, linear distribution of power than a single barrel in the calibre. At the end of the production process, the master craftsmen finish each component by hand, giving a result which cannot be reproduced by machine. The bridges are bevelled on a bench grinder, all the visible parts of the movement are circular-grained and the Côtes de Genève decorations add the finishing touch to the piece. The manual work invested in each calibre is immense, leading to technical marvels born from a perfect marriage of industry, watchmaking expertise and craftsmanship. SIHH 2018 - TICKETS ON SALE FOR THE OPEN DAY!